I was talking with a friend the other day about jewelry storage. The conversation first started out about how she can never find the right accessory for her outfit, because she can never find her accessories! Jewelry can be the one item that ties your entire outfit together or that changes it from a meh outfit to a totally amazing outfit! But if you can’t see or find the jewelry you have, that can make getting dressed in the morning or for a special event kind of tricky. 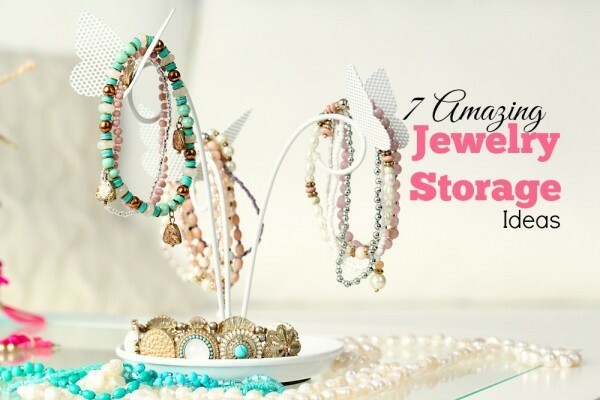 These 7 awesome jewelry storage ideas will inspire you to get your accessories organized, so you can put together an entire outfit – head to toe – in a snap. Martha Stewart (no surprise there) has several, if not hundreds, of great ideas for storing your precious accessories. If you don’t own loads and loads of jewelry, try storing them in tea cups. You can put them in a drawer or on your dresser. I can just imagine how great it would make me feel to open my drawer every morning and be greeted by little tea cups. Eyes of Style shows us how to create a DIY jewelry organizer using spray paint, two pieces of wood, hinges and hooks to hang your jewelry on. I love this! Annie from Fresh American Style lets us peek into her big girl dressing room, which includes some amazing jewelry organizing ideas. For the Makers shows us another fun DIY idea – with lace! Lace is the perfect material for earrings because of the already done for you holes. They also show how to dye the lace with tea, for another added element. Emily Henderson (love her) has a fabulous idea called jewelry blocks. These are perfect for necklaces, bracelets and rings. She doesn’t recommend these for expensive jewelry, but for the ones you throw off at the end of the night. 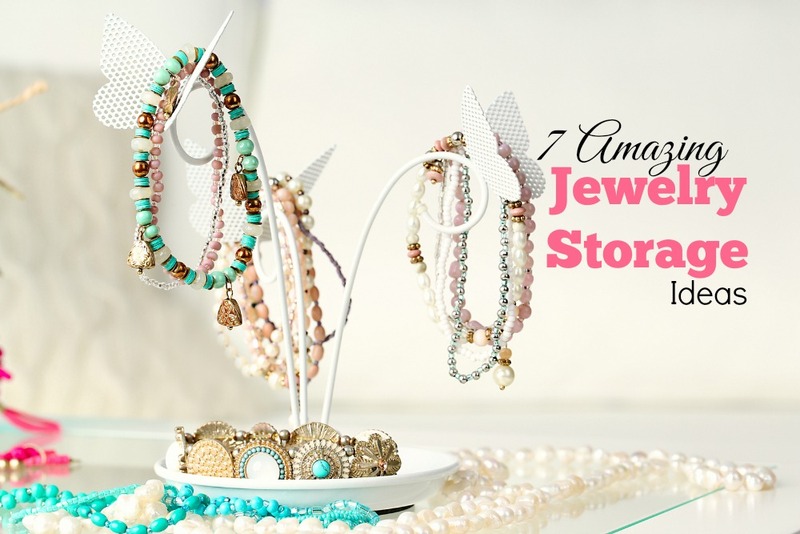 Shanty 2 Chic created an amazing jewelry storage cabinet. If you have a lot of jewelry, this DIY project is for you! I love how you open up the cabinet and it’s all right there together. It makes me happy just looking at it. The Decorating Duchess took a fabric organizer and a frame she found, combined them and came up with the perfect wall hanging jewelry organizer idea. This hanging, non-woven, jewelry organizer features 31 pockets and 18 hook and loop closures. It easily hangs as part of your closet on a rod. I love acrylic organizers. They have such a clean look to them and this 2-piece set is a best-seller and allows you to organize your jewelry and makeup together, if you’d like. If you have some wall space in your bathroom, closet or bedroom, this wall hanging jewelry organizer might be perfect for you. It features 8 large and 11 small hooks for hanging necklaces, earrings, watches, bracelets and more. Plus there is a shelf on top for storing larger accessories, or makeup and perfumes. Don’t forget about a jewelry box! This might be all you need and will fit in perfectly with your storage needs. This cherry wooden one is beautiful and holds a lot of jewelry with its dual necklace doors and four drawers. 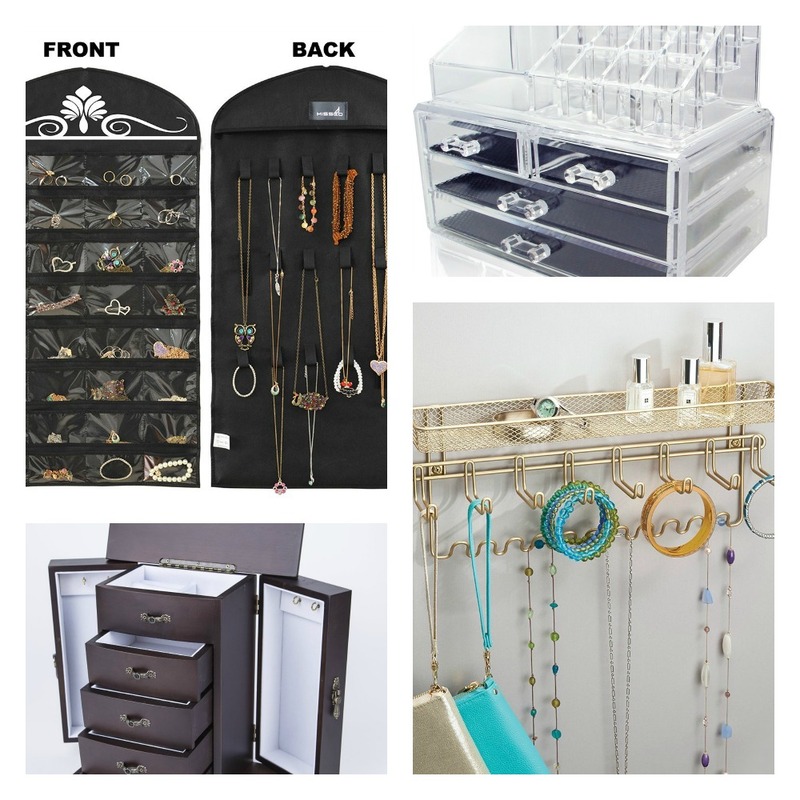 Do you have any special jewelry storage ideas you use?